Archbishop Cranmer School in Taunton houses both a School and Nursery and looks after 250 pupils. The buildings have a unique look due to their angular mansard rooftops. The traditional slate tiles that adorned the mansard roofs were in urgent need of repair, and Somerset County Council assigned a refurbishment program to contractors Henry Pollard and Sons. 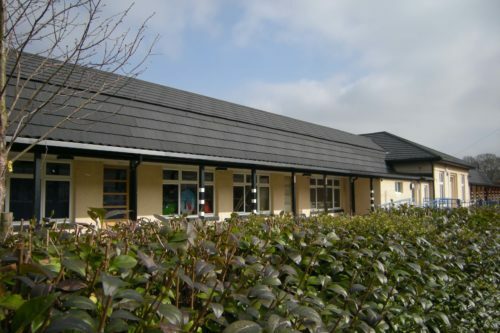 Roofing contractors Davey Roofing of Yeovil, who were assigned to the project, needed to replace the roof with a material that could match the visual properties of traditional materials yet keep the school dry for many many years to come. As is an unfortunate commonplace with school buildings, it was also necessary to increase the vandal resistance of the rooftop. Metrotile Slate in Charcoal was specified in .900 thickness for the all important increased vandal resistance. The new Metrotile roof has given Archbishop Cranmer School a refreshed facade, as can be seen in the surrounding images. The school roof also benefits from Metrotile’s industry-leading 40 year weatherproof guarantee, meaning the roof will still be there when current nursery pupils are in their mid-forties and beyond.